Originally developed in the cavalries of Europe as the test of theideal military charger, eventing is a three-phase riding competition that has now evolved into an exciting sport attracting interest from all levels of sports enthusiasts, from weekend hobby riders to professional international stars. Day one: Dressage - The French term for "training”, dressage is very important to the three-day event horse, as it helps to develop the muscular strength, suppleness, obedience and maneuverability needed the other two days of competition. 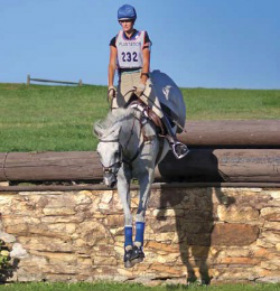 Day two: Cross-Country - The object of this test is to prove the speed, endurance, and jumping ability of the horse over varied terrain and obstacles. In order to accomplish this task, the horse and rider must be at peak condition. The horse must be bold, smart and obedient, and the rider must use knowledge of pace in order to expend only as much of the horse’s energy as necessary. Day three: Show Jumping - Not an ordinary show jumping competition, the sole object of this final test is to demonstrate that on the day after a test of endurance, the horses have retained suppleness, energy and obedience.